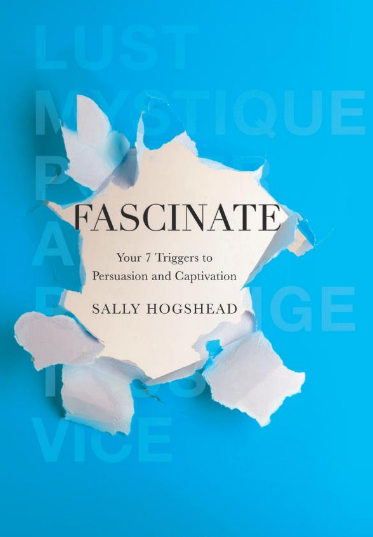 These are my “book notes” from reading FASCINATE: Your 7 Triggers To Persuasion And Captivation , by Sally Hogshead. How do you stand out in Google? Davis Scott is an incredibly common first and second name. It yields 1,160,000 results in Google. What my friend did was include his middle name. David Meerman Scott. Voila, he became a one and only. We developed the “F Score” to objectively evaluate the level of fascination generated by a product, brand, or idea. We have high and low scores. High scores- they use triggers with unusual intensity and vividness. They get their message across. in the extreme, its not always better. It’s not the same as likability or respect. Low Scores- tend to avoid extremes and avoid volatility. A low F score isn’t a problem unless someone wants to influence decisions and behavior. Fascination is a double edge sword. provokes strong and immediate emotional reactions. Becomes “Cultural Shorthand” for a specific set of action values. forces competitors to realign around it. How much do people naturally talk about you, or gravitate to you? The following Questions will help you start to think about your potential F Score results. How much appetite is there for your ideas and opinions? Fascinating people generate a lot of curiosity about what they’re doing now, and what they’ll do next. What kind of response do you elicit with your words, actions, or ideas? Fascinating people elicit intense emotional reactions from others. Positively or negatively. Do you prompt others to think in new ways? The most fascinating people disrupt usual ways of thinking. They reveal a different way to think. How often do others imitate you in their behavior, ideas, or techniques? Imitation isn’t just flattery. It’s a signal that you’re setting a standard of some sort. Not fascinating yet? Don’t panic. Over the long run, shy or low key personalities can be as fascinating as the most charismatic ones, especially if they trigger trust. Trust is the most powerful trigger in relationships, and the Low F Score often earns more trust than their high F counterparts. -the point is never for one personality type to magically transform into another, but rather to maximize existing strengths and remove barriers to communication. As Peter Drucker said, “The only definition of a leader is someone who has followers.” No fascination, no followers. Meet your new arsenal: Lust, Mystique, Alarm, Prestige, Power, Vice, and Trust. The central tenet of this book is: Anything, and anyone, can become fascinating. Nothing is, in itself fascinating. Context and meaning determines that. We all have triggers that turn otherwise ordinary objects into fascinations. Meaningless things fascinate consumers all the time, if a brand can give that object meaning with a logo. The Power of Branding is to make the unfascinating fascinating. -when consumers buy a certain brand, they’re often not paying for the utility of the item. What they’re actually buying is the trigger. -why we’re seduced by the anticipation of pleasure. -in any type of pleasure state, our mouths produce more saliva. Our tongue moves more fluidly within the mucous membranes of our mouth, creating what we call oral wetness cues. Lust fascinates through experience: our appetites of sight, sound, taste, touch, scent. We anticipate what it might be like to fulfill this craving, and that anticipation pulls us closer. -intentionally or not, subtle communication cues communicate our intentions. It’s true in our voices, and it’s true in our unconscious body language: withdrawn posture, broken eye contact, an insincere smile. Every communication is 2 conversations; the verbal one (the content) and the non-verbal one (body language). When someone’s words tell us one thing, but his body language and tone of voice tell us something else, which do we believe? People will believe the non-verbal communication every time. -55% visual, 38% tone of voice, 7% words. -if trust is the trigger that drives what you say and when you say it, lust is the trigger that drives how you say it. -trust stabilizes long-term relationships, and lust encourages people to return repeatedly. -lust is a promise of pleasure. It is not necessarily the fulfillment of that pleasure. As a motivator, desire is more powerful than fulfillment. -a mystique is eye-catching enough to get noticed, yet complex enough to stay interesting. Revealing enough to pique curiosity, yet shadowy enough to prompt questions. It doles out information without ever actually anything away. 1) Spark Curiosity – topics that spark our curiosity become discussed, debated, and dissected, often without ever being understood. -The Blair Witch Project. $35,000 cost grossed at $248 million. -is the collection of stories, traditions, and beliefs belonging to ma particular group or event. -stories are more powerful messages than facts. -one urban myth states that only two Coca-Cola executives know Coke’s formula; however they know only half. Executives who know the recipe cannot travel in the same airplane, because in case of a crash, the recipe will be lost forever. Know when to end your message. -why we take action at the threat of Negative Consequences. MADD (Mothers Against Drunk Driving) frequently use explicit photos in their advertising, shocking us into the reality of death. Teenage drivers aren’t as alarmed by the graphic threat of drunk driving, thanks to an adolescent sense of immorality. The solution, Luke Sullivan, a legendary advertising writer, made an ad that teenage drivers would be alarmed about. Losing their License. In the photo, the boy is being chauffeured to prom…by mommy. The sight of blood. An unexpected phone call in the middle of the night. Shooting chest pains. Losing sight of your child in a crowd. Freddy Krueger. 1) Define Consequences – by defining consequences associated with your message, you can more specifically shape behavior around them. -to increase the likelihood of action around your consequences, strengthen your argument with a deadline. -when deadlines are applied, we’re forced to make a decision. Indecision is a decision. *Alarm based marketing logic often goes something like this: There is a limited quantity (scarcity). Unless you act now (urgency), you’ll lose your opportunity (consequence). -what if the person stuck in apathy is you? If you need to direct a specific action, deadlines create focus. If you’re a procrastinator, alarm can be your best friend. 4) Focus not on the crisis most likely, but on the one most feared. -generating a sense of urgency often has less to do with rational threats, and more with understanding human behavior. -11 people were trampled to death, owing to the threat of a negative consequence: missing a good seat to watch the Who in concert on December 3, 1979. 5) Use distress to steer positive action. *UNICEF- around the world, 990 million people live in a state of crisis, without access to clean and safe drinking water. To fetch water in many developing countries, girls and women must walk up to 3 hours daily. 4, 200 children die every day from not having clean drinking water. In 2007, the ad agency Droga5 invented a solution named the Tap project. Diners in restaurants donate $1 for tap water before a meal. With each dollar, UNICEF gives a child clean drinking water for forty days. -why we fixate on symbols of rank and respect. -this season’s must-haves become next season’s has-beens. -this trigger applies to any form of social position that demonstrates one member’s position relative to others. -just as they paid absurd prices for tulips 375 years ago, today people pay absurd prices for logos. -emblems fulfill a deep, instinctive need because they say something about us. Abraham Moslow calls this self-esteem. We satisfy this need by communicating our value to the world around us. -examples: Mary Kay Pink Cadillacs, Alcoholic Anonymous members mark sobriety with coins. It changes perceptions and shifts its entire category. -Ex: Setting a New Standard. Grey Goose Vodka, House of Winston. They set a new price category higher than the ordinary. -Scarcity. Someone paid $14.3 million for a license plate. It features the number 1. In the oil-rich and car-obsessed culture of Dubai, license plates are a matter of personal pride. Most plates have 5 digits. But the lower the number, the higher the price tag. -Exclusivity, A higher price tag isn’t a barrier to purchase, but rather an incentive. -it demands meaning in order to justify the fascination. -Why we focus on the people and things that control us. -deep within our tribal psyche, we share a need to focus on the most powerful members of our group. Programmed into our social code is a need to follow the leader, to find role models and fixate on them. *story: An experiment that offered thirsty rhesus monkeys a choice: a drink of their favorite beverage, or an opportunity to look at photos of celebrity monkeys. Celebrity monkeys are those that commanded attention in their pack. They chose the look at the photos. -psychologists suggest that when people are no longer in charge of basic elements of a situation (such as where they sit, or when they go to the restroom), they must give some degree of control that they normally use to define their independence, and thus themselves. Many researchers have proven that once people have agreed to let go of small details, they become more willing to submit to the more significant changes. By gradually releasing self-control, they open themselves up to more significant changes, and to the leader. Its how brainwashing works, how boot camp works, and to a greater or lesser degree, it’s how most immersive learning works. -Why we’re tempted by forbidden fruit. -when we’re told we can’t have something, it can take hold and make us want more. -vice includes everything you want to do, and know you shouldn’t do, but still just might want to do. -a little vice goes a long way, so customize your message byn using it in combination with other triggers. *In the kelton survey, 60% of Americans said they would be willing to bend their morals, standards, or loyalties in order to have a more interesting life. -the word vice comes from the Latin vitium, meaning “failing or defect,” because vices reveal our weaknesses. Vice tempts us to break out of strict norms, or bend the rules a bit. *Black box in a room and you tell someone not to open it. Las Vegas…”What happens here, stays here. Gossip Girl. It became popular when they changed it. Viewers celebrate the show that celebrates bad behavior. *DARE (Drug Abuse Resistance Education) spends more than a $1.13 billion a year but is ineffective. -Enforce rigidly back and white behavioral codes. -Give a firm no without a reasonable why. -Use the unopened black box. To overcome vice, adjust 3 triggers…decrease mystique, and increase power and trust. -stir up new energy around a topic. -two triggers used together can be stronger than either one alone. *Hugh Grant with Divine Brown the prostitute. She earned 1.6 million in the ensuing publicity. In a newpaper article titled “Hugh’s Divine Intervention” it brought her a 4 bedroom home and private school education for her children. *The purpose of a message with vice isn’t to lure your audience into sin, but rather to lure them away form thei standard choices. *Trust- why we’re loyal to reliable options. *It’s a wonderful life succeeded through familiarity and repetition when their copyright protection slipped and television networks aired it for free. -Trust guides everyday decision making in a different way: familiarity and comfort. -the word familiar comes from familia, meaning family. -our mind look for patterns, we base it on pattern repetition. *The Exposure effect- in 1876, Gustav Fechner coined this principle. The more we are exposed to something or someone, the more we trust it. *An experiment presented to children ages 3-5 years old had them eating two different sets of chicken nuggets. One in McDonald’s packaging and an unbranded one. They like the McDonald’s packaged nuggets better even though in reality, the contents of the boxes are the same. Even carrots, milk, and apple juice that are not part of McDonald’s menu tasted better when package with the brand. By age 3, their taste buds were already tricked into imagining superior taste. -the reward for earning trust is a big one: Loyalty. In certain circumstances, we want to know exactly what to expect. -the more predictable a message, the more we rely on it. -if you tell a lie big enough and keep repeating it, people will eventually come to believe it. –Nazi propaganda chief Joseph Boebbels. -a study for every hour per day spent watching Baby Einstein, infants age 8 to 16 months understood an average of 6 to 8 fewer words than those who did not watch them. -trust builds a strong expectation of future behavior based on past behavior. 4) Accelerate trust in a short time frame. -to accelerate trust, a message can tap into values that extend over time. -yesterday’s tired facts can be reinvented anew. -real estate professionals often use the scent of baking bread or cookies when showing a home to buyers, because the nostalgic scents cue unconscious memories for many buyers. 5) Un-fascinate an unhealthy message. -we gravitate to unhealthy messages whether they’re healthy or not. Fast food is an ingrained message, and as a consequence, obesity is a negative consequence of trust. -by identifying a new positive message, and introducing a variety of new ways to experience that message, we can start to loosen the grip of the old one. *Edible Schoolyard. Kids are taught how to plant vegetables at the schoolyard so that they can experience it before they eat it. -How to make your own messages more Fascinating. Assess your current levels of fascination, create new forms of fascination, and then successfully apply potential ideas. -fascination lives not in your own communication to the world, but rather in how the world communicates about you. Outlier- is a scientific term to describe things or phenomena that lie outside normal experience. Ex: Sear introduced a products badge…lifetime guarantee. They were willing to go all the way to the edge, where no one in the category had done. The Fringe- the degree to which you are willing to step outside your category norms is the degree to which you’ll fascinate others. -better to be exceptional in one or two areas than pretty good in all. What if questions sit at the heart of any fascination development process. Causes strong and immediate reactions. -if you’re not generating a negative reaction from someone, you’re probably not fascinating anyone. -your fans may be a small slice of your overall base, but they’re the most passionate and vocal, and they’ll participate in your marketing work. -In an attempt to be all things to all people, most brands end up saying nothing to anyone. -are you a mac or a pc. -people don’t want to connect with brands. They want to connect with one another. -when the number of military recruits dropped, the military started conversations among potential recruits by creating a video game. Future Force Company Commander or F2C2. -Zappos.com bought by Amazon for $928 million. -imagine 7 beakers filled with liquid depending on the level of you triggers. These 7 elements combine in a sort of chemical formula, a.k.a your brand. 1) An overload of distracting choices. -all the options at Starbucks or Netflix. 2) The rise of the ADD world. -20 minutes long when we lived in a farm. -because of web surfing, Twitter 140 characters, our attention span now is 9 seconds just like a Goldfish. So when you direct your message, don’t think of your target market but of a Goldfish. The Fascination Economy. After the IT, experience economy. A test with 1k people. They are willing to pay four times as much. They also want to be fascinating. Women are willing to pay for more than food and clothes combined. 15% of their take home income. -causes strong and immediate reactions. -becomes “Cultural Shorthand” for a specific set of action values. -forces competitors to realign around it. *Its not a model that’s based on earning attention, it’s a model that’s based on getting to what people are already doing. And finding a way to create their behavior so that their willing to advocate for you and champion for you so that they will feel connected to you. Who do you want to Fascinate? The people that you love the most are the people who needs to hear your messages. Not giving an information but emotionally connecting in a way that makes you use your most natural persuasive strengths to build those relationships.